I'm one of the thousands of followers of Chuvaness.com and ever since I've joined in her bonggang pa-raffles, I've never been lucky. Just last week, she had another raffle. 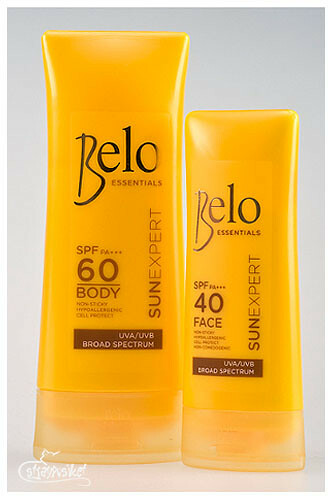 This time, it's a Belo Sunblock Kit for 10 lucky winners. And for the nth time, I tried my luck. I followed the instructions and closed my twitter window. I totally forgot about the raffle until last Wednesday I received a notification on my email. 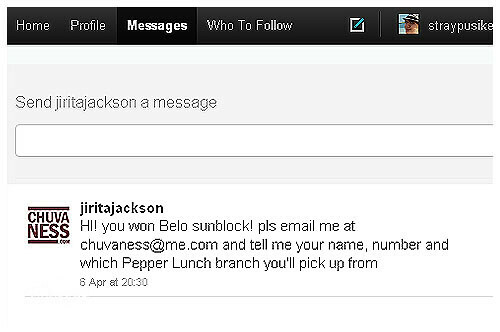 It said that I have a DM from Ms. Chuvaness herself! Yipee! I opened it and was surprised that I won in the raffle! So last Saturday, I went to Pepper Lunch Shang with D to pick up my prize. 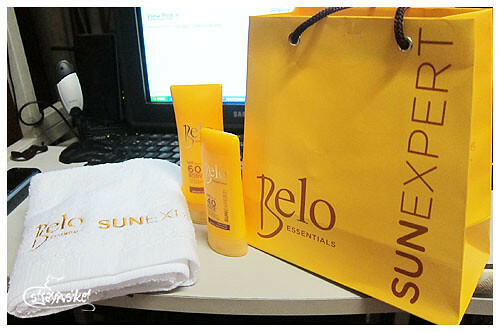 The kit comes with a 100ml Sun Expert Body Shield SPF60(SRP: Php449), a 50ml Sun Expert Face Cover SPF40 (SRP: Php299) and a white towel. Want to win stuff like these? Follow her blog na!